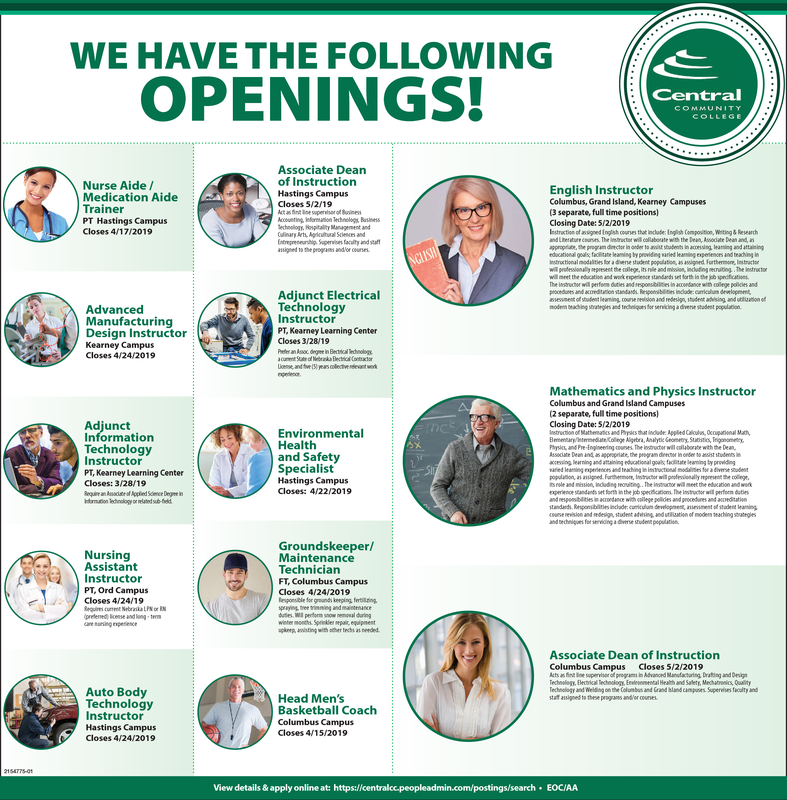 We Have The Following Openings! Require an Associate of Applied Science Degree in Information Technology or related sub-field. Prefer an Assoc.degree in Electrical Technology, acurrent State of Nebraska Electrical Contractor License, and five(5) years collective relevant work experience. Responsible for grounds keeping, fertilizing, spraying, tree trimming and maintenance duties. Will perform snow removal during winter months. Sprinkler repair, equipment upkeep, assisting with other techs as needed. Instruction of assigned English courses that include: English Composition,Writing & Research and Literature courses.The instructor will collaborate with the Dean, Associate Dean and, as appropriate, the program director in order to assist students in accessing, learning and attaining Educational goals; facilitate learning by providing varied learning experiences and teaching in instructional modalities for adverse student population, as assigned. Furthermore, Instructor will professionally represent the college, its role and mission, including recruiting. .The instructor will meet the education and work experience standards set forth in the job specifications. The instructor will perform duties and responsibilities in accordance with college policies and procedures and accreditation standards. Responsibilities include: curriculum development, assessment of student learning, course revision and redesign, student advising, and utilization of modern teaching strategies and techniques for servicing adiverse student population. And techniques for servicing adiverse student population. Acts as first line supervisor of programs in Advanced Manufacturing, Drafting and Design Technology, Electrical Technology, Environmental Health and Safety, Mechatronics, Quality Technology and Welding on the Columbus and Grand Island campuses. Supervises faculty and staff assigned to these programs and/or courses.